I don’t know about you but I just love that spicy Korean Pork (Dwaejibulgogi) that you get at a good Korean BBQ joint. Sweet, spicy, tender, and delicious that BBQ pork always leaves me wanting more! The secret to that flavor is Gochujang which is a fermented chili, bean, and rice paste that is very savory and gives the pork that distinctive red coloring. With that in mind we set out to recreate those flavors in a Stir Fry on the Big Green Egg. 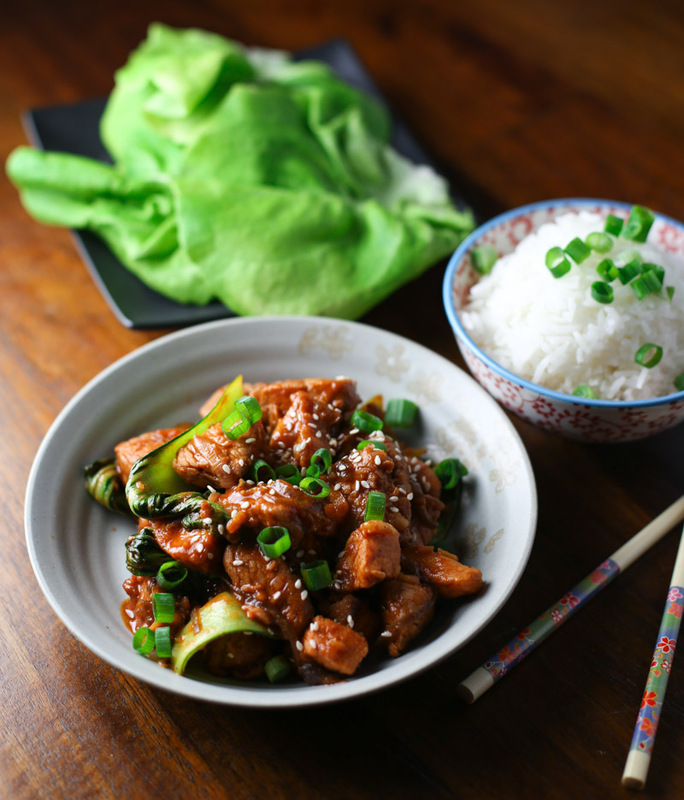 This recipe for Spicy Korean Pork Stir Fry is really delicious… I mean REALLY delicious!!! Enjoy. There is one thing I know about Korean cooking and that is there is a lot of garlic involved. The more garlic the better it is. With that in mind we gathered the ingredients for the marinade. Garlic cloves, ginger, Gochujang, Mirin, Korean Rice Wine, and a Pork Loin. Next mince the garlic cloves and piece of ginger. Mix with the Rice Wine, Mirin, and Gochujang. Cube the Pork Loin and mix with the Marinade. Pour contents in Ziploc bag and marinate overnight. Heat the Big Green Egg to 500° and place the Lodge Cast Iron Wok on the grate to preheat. Slice the Onion and the Bok Choy. Place 2 Tbls cooking oil in Wok. Add onions to the Wok and stir fry until soft. Add the pork mixture to the Wok and stir fry until pork cooked through (about 10m). Add the Bok Choy and stir fry until wilted. Garnish with Green Onions and Sesame Seeds. Serve with Rice (Bap) and Bibb Lettuce Leaves. This recipe for Spicy Korean Pork Stir fry is sure to please. Great dish to make on the Big Green Egg with a Lodge Cast Iron Wok. Mince the garlic cloves and piece of ginger. Mix with the Rice Wine, Mirin, and Gochujang. Pour contents in Ziploc bag and marinate overnight. Place 2 Tbls cooking oil in Wok. Add onions to the Wok and stir fry until soft. Serve with Rice (Bap) and Bibb Lettuce Leaves. This dish was absolutely delicious! Yum, I love a good stir fry. You have clearly cooked this to perfection – it looks so delicious!